Osmosis’ theory is about delivering nutrients to the body and skin in the most efficient way possible without causing additional inflammation. Believing you should treat your skin not only topically but also from within, their products range from straightforward skincare such as cleansers and serums to wellness supplements. While all Osmosis cleansers are safe for any skin type, they have different products based on your needs including Osmosis Skincare Cleanse, a gentle cleaner; Deep Clean to remove deeper impurities; and Purify Exfoliating Cleanser. Even using Purify twice a day, I saw no dryness or irritation and my face felt tighter and refreshed after every use. That is definitely something I have never experienced with other exfoliating washes! My serum of choice is the Osmosis Skincare Clarify because it targets a wide range of my skin problems. It shrinks pores, provides protection against acne, while also hydrating, and it has a sunscreen. I’m all for shortening my morning routine and this is a hugely effective help! One step does it all. Their other Treatment Serums address problem such as aging, dark spots and even rosacea. They literally have something for every skin concern! One of Osmosis’ greatest products I have found is Osmosis Skincare Quench. It is an intensive hydrater that is powerful yet still so light weight AND not greasy at all. My skin tends to go on strike in the winter and this product calms and restores hydration immediately without leaving me feeling like I need to blot my face in an hour. Definitely loving this product! I have recently started my husband on Osmosis Skincare Refresh PM Eye Repair Serum for his baggy, dark circles under his eyes. He’s only been using it about a week and people have made comments that he looks healthier and more rested! And at least with my husband, just looking like he’s getting more sleep makes him less cranky! Thank you Osmosis! The most unique thing Osmosis brings to the table in my mind is their use of wellness supplements in skin health. I mean, it seems like a no-brainer that you need to heal and treat your skin not only on the surface but also from within. They have a whole line of Harmonized H2O that help with digestive health, hair and nail strength, and the one I really want to try is the Osmosis Harmonized H2O Hangover! I could have used this little lifesaver just a few evenings ago! Osmosis has some great kits based on your skin type that include everything you need to get your skin healthier and looking beautiful at the same time. Sometimes I feel like I have to sacrifice one for the other but Osmosis proves that you can do both! Finally! 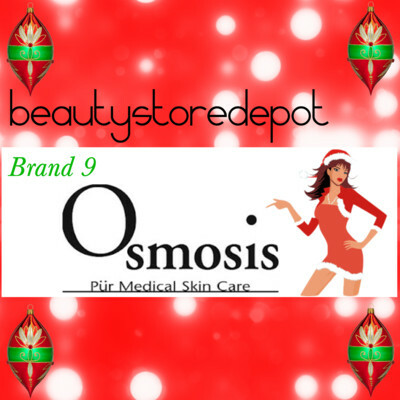 Osmosis Skincare is our first featured brand this week during our 12 Brands of Christmas promo. We will be giving away 3 kits that include a FULL size Calm, a travel size Purify and Quench. These kits are valued at $66.00. In addition, we will also be giving away another single FULL size Calm and a travel size Quench and Purify. Just watch out for the posts and additional information on how YOU CAN win on Facebook. Don't forget....we are also giving away a Clarisonic Mia on our Google+ page. Just become a follower and respond to the appropriate post to receive your entry. Good luck! Osmosis sounds awesome! I'd really love to try their Calming Powder Blend and the harmonized waters sound really interesting.